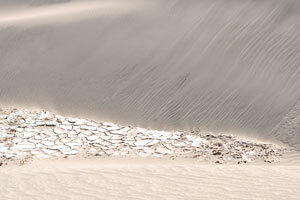 The first interesting thing we saw after leaving the Hamed Ela camp were the sand dunes. 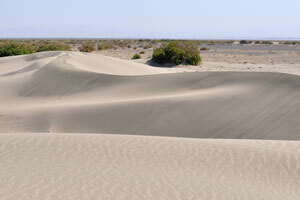 We met the sand dunes on our way to the Erta Ale volcano. 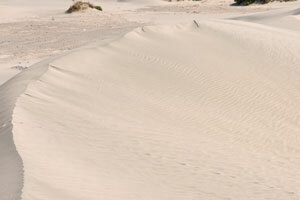 Surface of the sand dune. 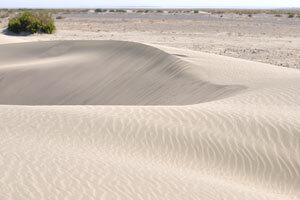 It was the biggest ridge of wind-blown sand on our way from the Hamed Ela village to Erta Ale. 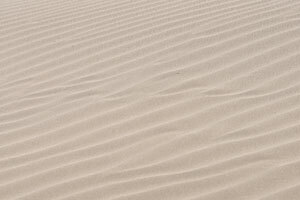 Cracked surface of the desert. 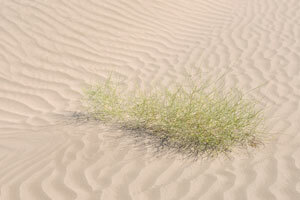 Grass that grows in sand dunes. 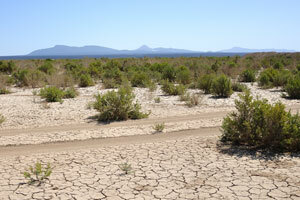 Our jeeps on the road to volcano. 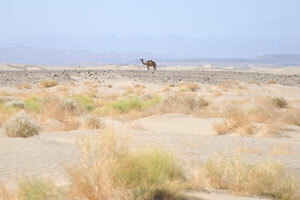 Alone camel in the desert. 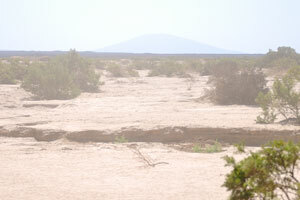 Surrounding landscape on the road to volcano. Visibility has fallen sharply because of the dust. 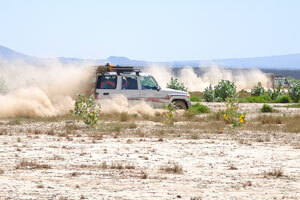 Our jeeps race through the desert at breakneck speed, raising clouds of dust, visible for miles around. 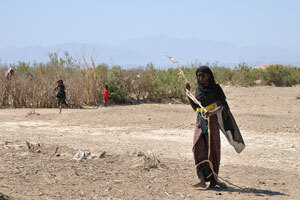 Woman from the local tribe. 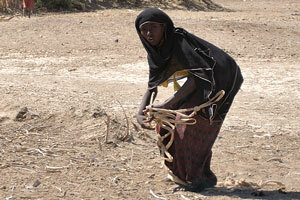 Tribal woman is going to take the stone from the ground. 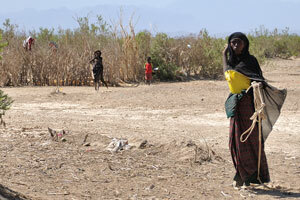 We do not want to bother this family, we just made the stop for our needs. 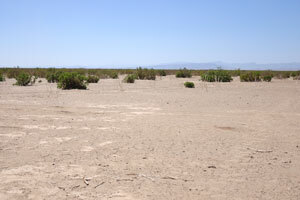 Desert on the way to volcano. 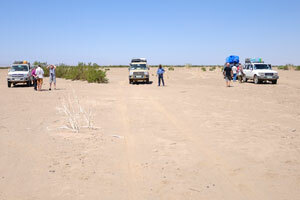 Our jeeps stopped for some time. 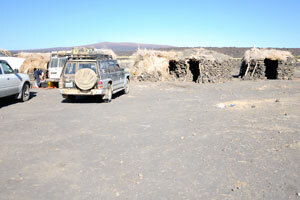 Vehicle with the German tourists travelling to Erta Ale was exploded by the land mine in this place. 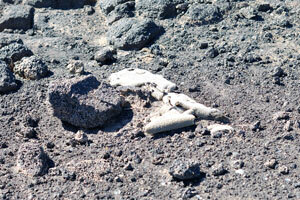 The remains of the exploded vehicle. 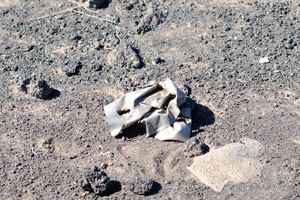 The remains of the car from the land mine explosion in 2009. 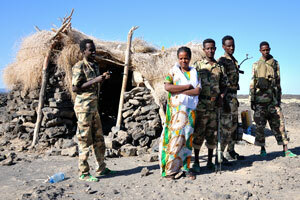 Afar soldiers in the camp located close to the base of volcano. 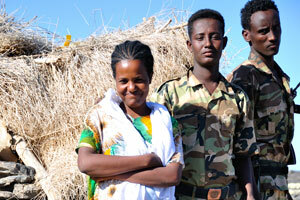 Lovely young girl from the camp smiles to me. 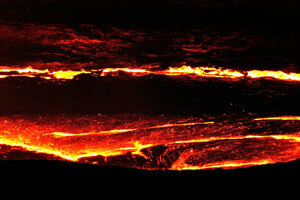 This camp is located at the base of volcano. 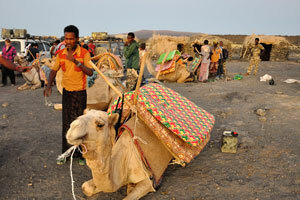 Camel will bring the mattresses to the camp located close to the crater of volcano. 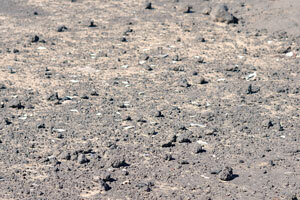 This camp is located in 8.5 kilometers (~ 5 miles) from the crater of Erta Ale. 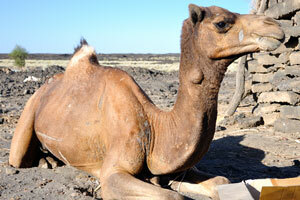 Camel do not like crackers and cookies, it prefers dried sliced bread. 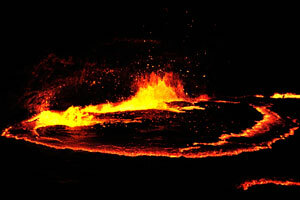 I will call this camp as the Base camp because it is located at the base of the volcano. 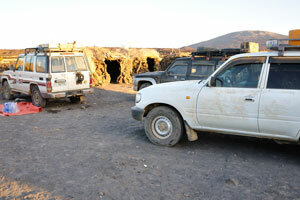 Our jeeps in the Base camp. 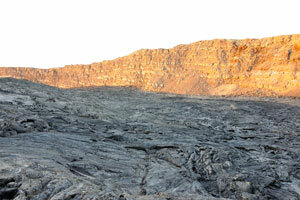 We have been waiting the sunset time to go to the volcano crater from the Base camp. 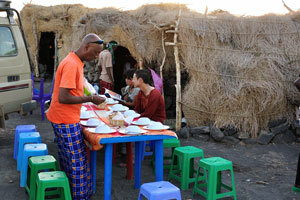 The supper time just before our departure to the volcano crater. Maiko is the name of this lovely girl from Japan. 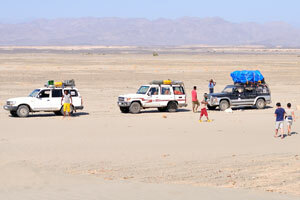 Four people from our group will use camels as the vehicles to get to the crater, fortunately it's not me. 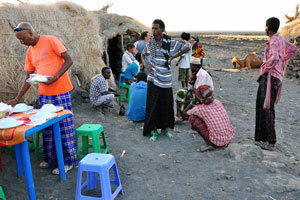 Our group is gathered together and will be prepared soon for the departure from the camp. 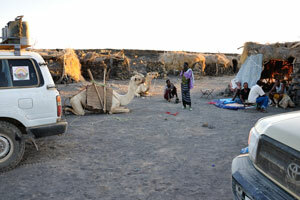 One woman successfully tries to sit on the camel. 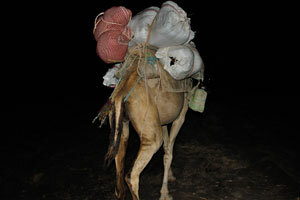 One of the camels on our way to the crater. Wow! 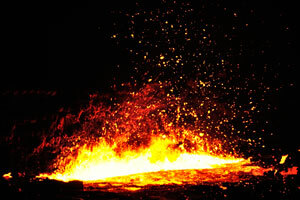 I am at the edge of the volcano's vent. 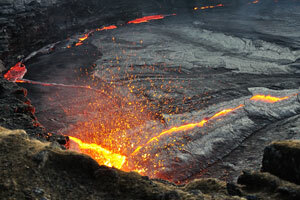 I am few meters from the vent of volcano. 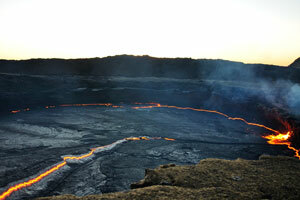 Level of active lava lake in the crater has risen considerably during recent months. 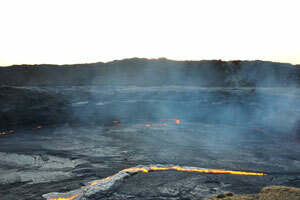 When we approached to the volcano vent we saw the huge eruptions. 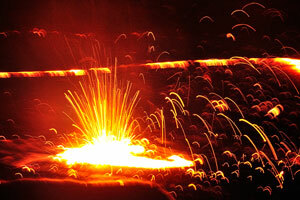 Non-explosive eruptions usually begin with fire fountains due to release of dissolved gases. 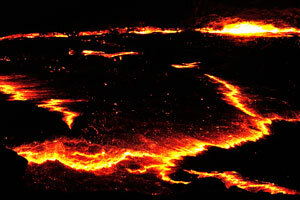 Lava lake in the time of high activity, few minutes before the next eruption. 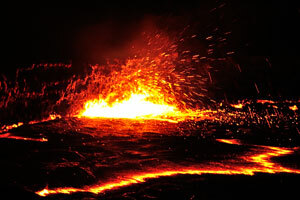 Volcanic eruptions are caused by magma - a mixture of liquid rock, crystals, and dissolved gas. 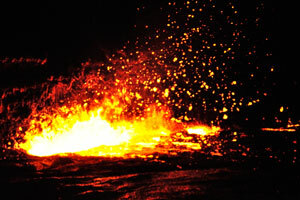 When magma reaches the surface of the earth, it is called lava. 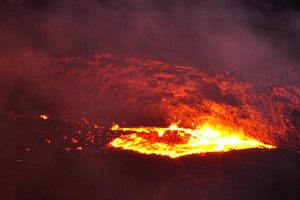 Erta Ale volcano is a large basaltic shield volcano in the central northern Danakil depression. 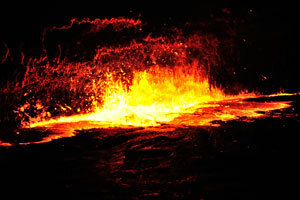 Erta Ale volcano is famed for its persistent lava lake. 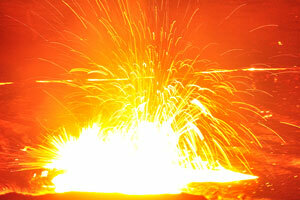 Erta Ale is only 613 m high. 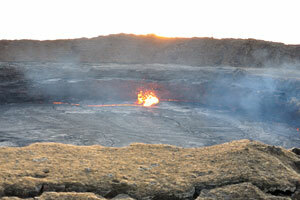 Erta Ale is one of the main attractions of the Danakil. 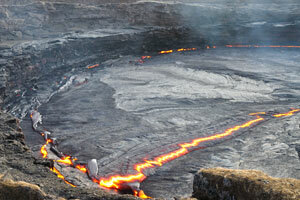 Erta Ale is one of the few volcanoes in the world that have an almost persistent lava lake. 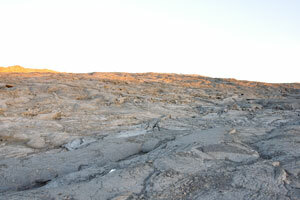 The volcano contains a 0.7 x 1.6 km elliptical summit crater. 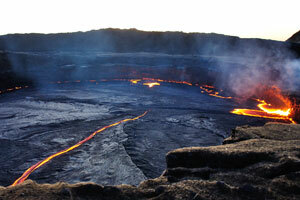 When we approached to the lava lake we saw large eruptions but later they became smaller. 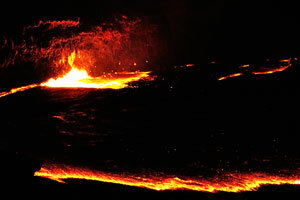 Volcano was very active in the evening but not in the night. 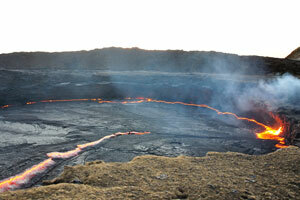 We observed eruptions of the lava lake several hours. 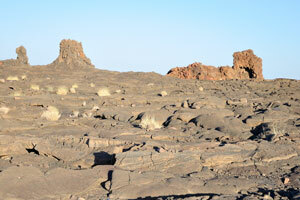 Eruptions became smaller and we decided to return to the camp located at the edge of crater. 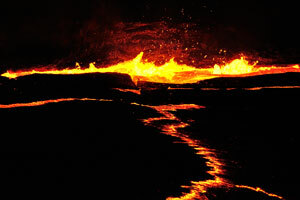 We have decided to return to the lava lake early in morning. 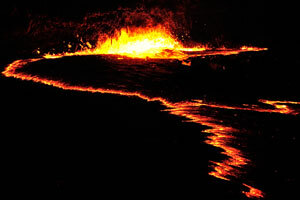 Lava of the lake in the morning before the sunrise. 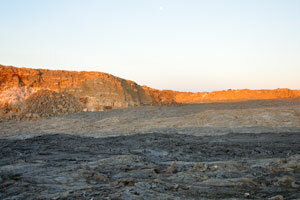 The very beginning of the sunrise over the volcano. 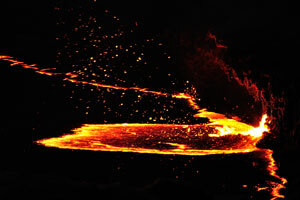 Sometimes the volcano became more active. 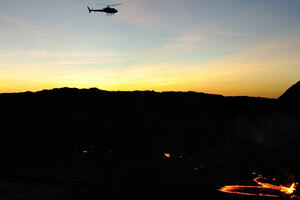 A bit later we saw the helicopter flying over the volcano. 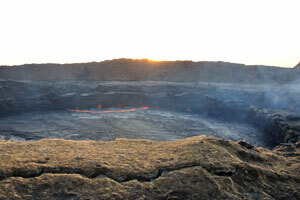 Sunrise reveals the details of the lava lake surface. 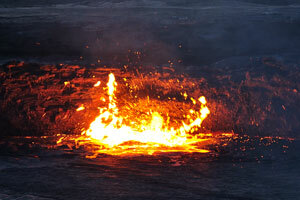 This crack has been created in the volcano's vent few minutes ago. 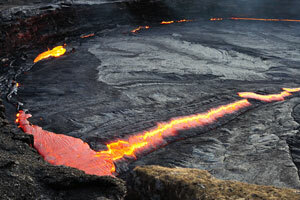 Highly viscous lava oozes out of the newly-formed crack. 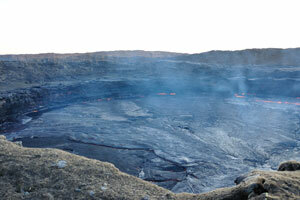 Smoke is over the vent of volcano. 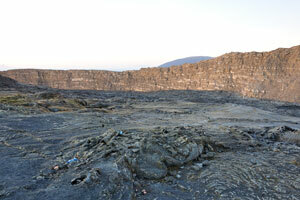 We met the dawn at the vent of volcano. 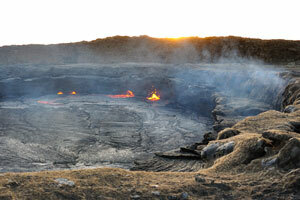 Not all people from our group came to the vent of volcano in the dawn, yet I was fortunate. 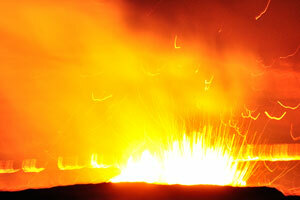 The new eruption has just begun, the fire fountain goes right from the throat of volcano. 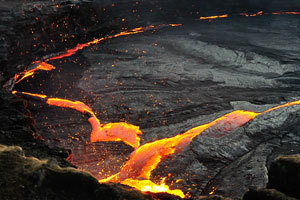 But this lava eruption did not last long and collapsed in five minutes. 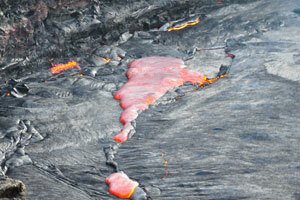 New cracks with an orange lava were formed in the vent a bit later. 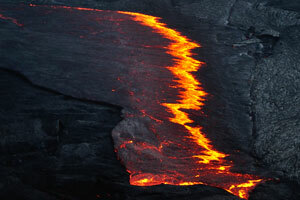 Viscous lava flows on the surface of vent inside the pit crater. 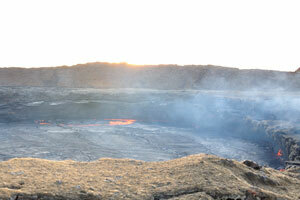 Erta Ale volcano has a huge crater. 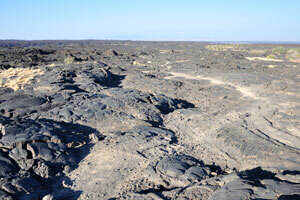 I am standing on the solidified lava of the volcano crater. 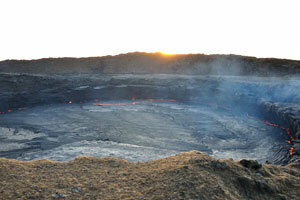 An active volcano pit is pretty small now but as you see the vent could grow to a gigantic size. 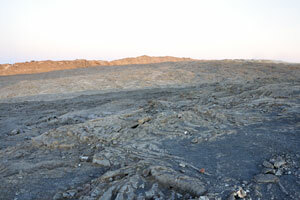 Vent of volcano in February 2015. 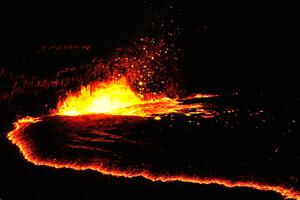 This morning the vent of volcano is almost passive. 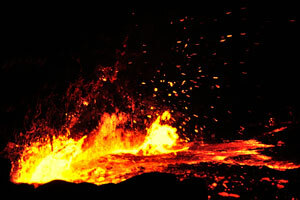 Sometimes the quietness of volcano is interrupted by sudden eruption. 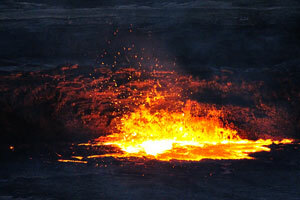 Erta Ale is a shield volcano in the Afar region of Ethiopia. 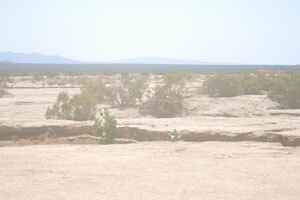 One may notice the camp in the distance placed on the edge of crater. 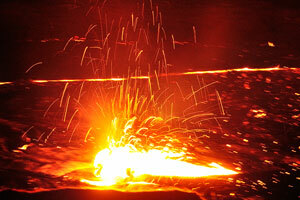 Erta Ale has undergone seven eruption events in the past 125 years. 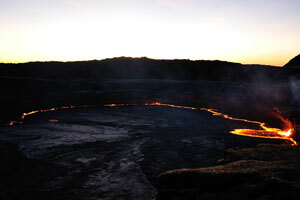 Volcano is awesome just after the sunrise. 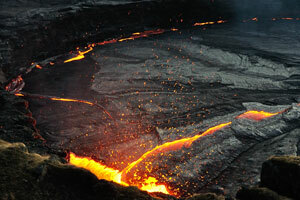 One should be very cautious because the solidified lava crust could be very thin. 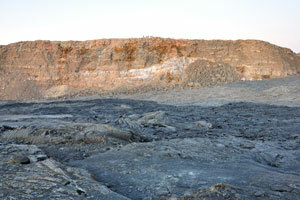 Crater is fully covered by solidified lava. 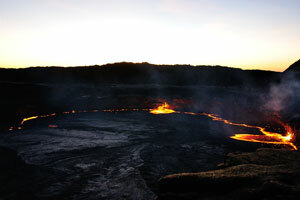 This camp is located at the edge of the volcano crater, I have named it the Crater camp. 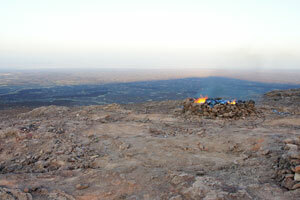 Campfire at the edge of the crater. 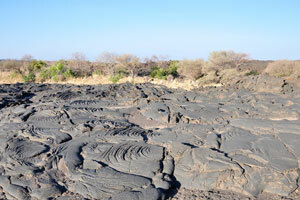 Lava fields on the way back from volcano. 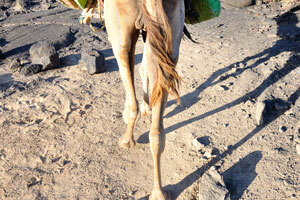 I walked behind the camel a small part of the way. 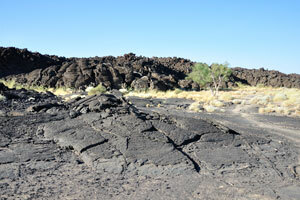 Solidified lava fields are very wide. 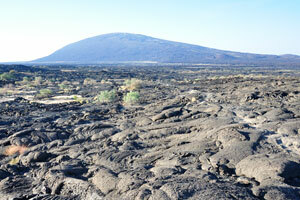 Sometimes you may see the island of vegetation amidst the lava field. 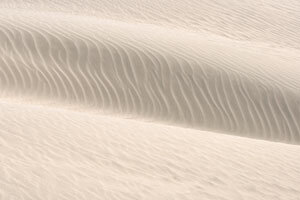 Look attentively and try to find the hill with the shape of heart. 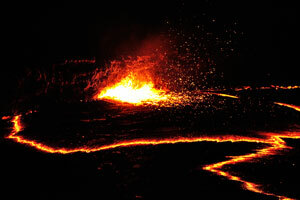 To get to the volcano crater you must overcome 8.5 km (approx. 5 miles) by this road. 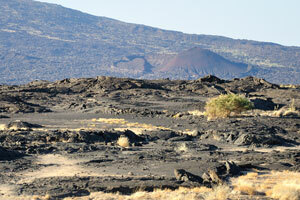 We almost came to the camp located at the base of volcano. 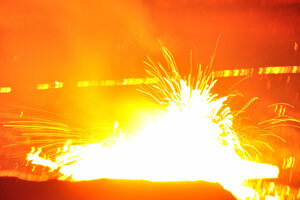 Employees in the camp located at the base of volcano. I like to photograph local employees. 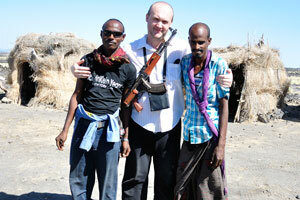 My trip was an unforgettable experience, look, it is me armed with an assault rifle. 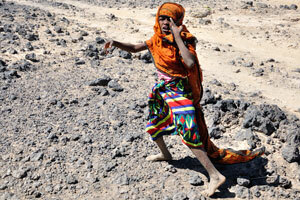 Little Afar girl is running beside our jeep while we drive. 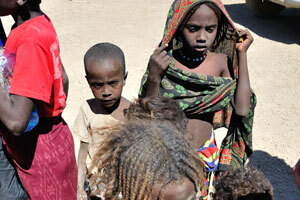 Guide told us the children appeared around our jeeps and we have stopped. 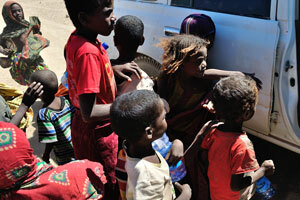 Afar children from nearby village surrounded our 4x4 vehicle. 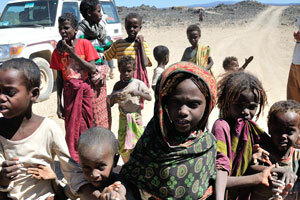 Afar children have extremely expressive faces. 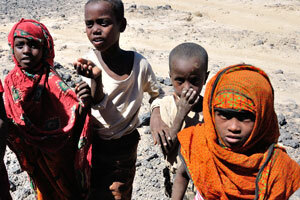 Afar children ask to give them candies. I had some candies which were successfully handed out to local children. 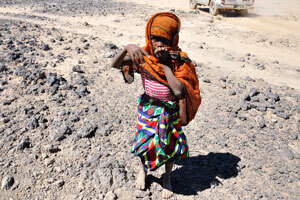 Children's faces were covered with dust. 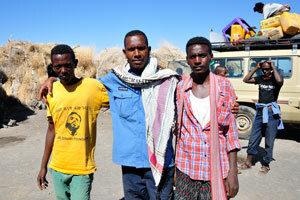 We must be in the Semera town soon and we should leave this friendly village.